The latest in a long line of personal head-mounted video displays was unveiled this week in Tokyo by the ominously named Scalar Corporation and it was no surprise to see the hallowed name of the iPod invoked once again to justify its development. 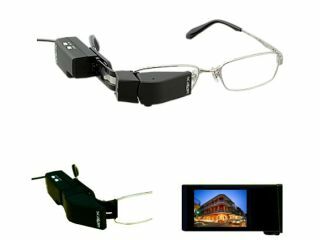 For ¥102,900 (£430), would-be futurists get an entire briefcase filled with gadgetry, including the headlining act - the Teleglass T3-F - which features a miniature screen that clips onto the outside of one lens in a pair of normal spectacles. As with all such systems, the idea is that a small display close to the eye can fool the brain into believing it's viewing a much larger one farther away. In this case, the 0.24-inch, 960 x 240-pixel screen translates to a 28-incher at 2m. Other gear in the box includes an iPod cable (yawn), an RCA cable, a carry case and a 4-hour battery. Although the glasses-mounted element of the T3-F weighs just 35g, we can't imagine wires going to both the 27g battery box and whatever video source is in use make for much of an experience. Scalar was guilty of wheeling out the tired old line about long Tokyo train commutes justifying investing in a personal video system (how about a good book? ), but it did redeem itself by suggesting medical applications for the display are in the pipeline. That's more like it.